Let me say right up front that this post has nothing to do with horses. Well, I suppose if I wanted to stretch things, I could make a case for how crows are related to horses… simply by the fact that they’re often found near horses! 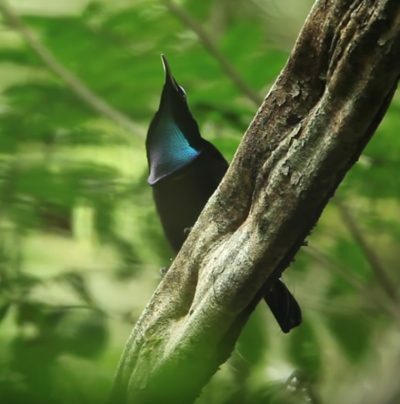 But no, really, this post exists simply because of the sheer wondrousness of these Birds Of Paradise – who are most closely related to crows. Tim Laman and Ed Scholes spent eight years (!) studying and photographing these birds in remote regions of Papua New Guinea on down to the east coast of Australia. Tim took almost 40,000 photos during that time and some of his best footage is distilled down into this 5-minute video that quite simply blew my mind. Honestly, we live in such an awe-inspiring world. The creativity and artistry of these birds inspires me to reach higher in my own life and creative endeavours. Thanks for sharing Jini…Mother Nature is so extraordinary there are just not words for the beauty and majesty she offers. My true hope is that theses places can survive mans thirst for distruction and resources.